The 2015 – 2016 TV season is done, and the past year felt like such a mixed bag. This was the first season in a while that I felt any excitement about, and in a lot of ways it failed to live up to my expectations. Here are my thoughts about the shows I watched (but don’t expect any deep analysis here. A TV critic I’m not). My favorite show of the season. Unlike DC’s cinematic properties, The Flash is optimistic, light, and fun, and the drama never reaches the state of quasi-nihilism that has made the DC movie such downers. Grant Gustin is a highly likable protagonist and he has a great support cast, particularly in Carlos Valdez and Jesse L. Martin. My wife and I have vowed to abandon the show if either of their characters are killed off. The show also knows how to press the geek button in obvious and subtle ways. 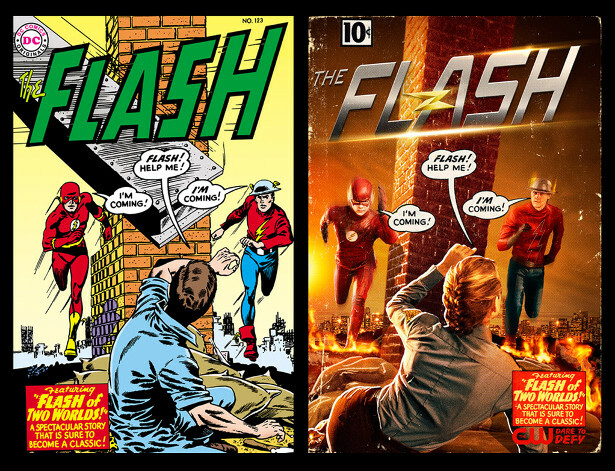 A geeked out hard when the show recreated the iconic Flash of Two Worlds cover in a blink-and-you’ll-miss-it scene. Pure nerdvana. Season two also did a better job with Candice Patton’s character, Iris West. The writers gave her more to do than simply be the hero’s love interest, which is great. The character still had a few moments that made me roll my eyes, but the season as a whole gave me hope she’ll continue to improve. It’s perhaps ironic that The Flash has a tendency to fall apart at the finish line. The season one finale ended on an abrupt, awkward cliffhanger that set the stage for season two, and similarly, the season two cliffhanger on a “Huh?” note that lines up season three. The creative team needs to be better about putting a button at the end of a season arc. Supergirl had some first season shakiness, but its issues were minor as far as I’m concerned. 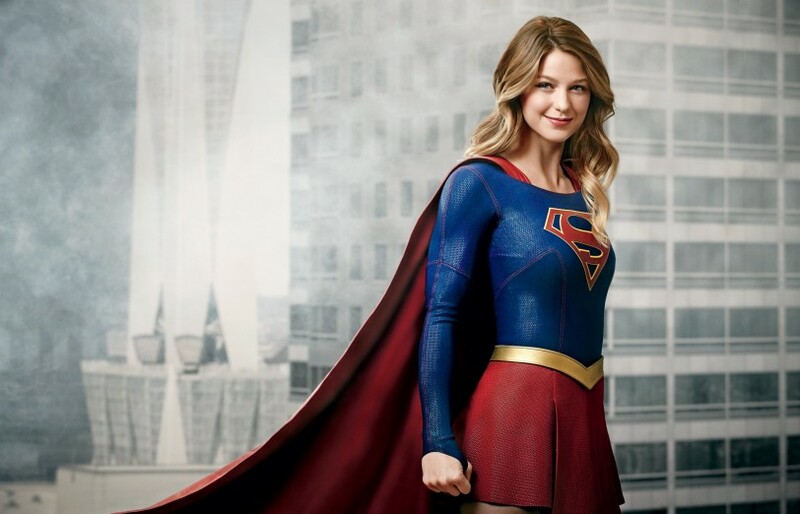 As with The Flash, Supergirl benefited from a brighter tone and a more upbeat, positive lead in Kara Zor-El, played with irresistible charm by Melissa Benoist. However, Calista Flockhart — as Kara’s boss, Kat Grant — almost stole the show every time she appeared on-screen. She started off as a typical boss-from-hell ice queen but quickly developed depth and texture as a character. By the end of the season, she was as lovable (in her own aloof, prickly way) as Kara, and the two made for a great if unlikely team. I also have to give the writers credit for a great swerve. In the comics, Hank Henshaw (David Harewood) became the Superman villain known simply as the Cyborg Superman (as a result of the overhyped Death of Superman storyline) and I was expecting the TV show to go the same way — and then it blew me away by revealing Henshaw was in fact J’onn J’onzz, the Martian Manhunter. ABC canceled The Muppets after a full (if short) season and I hate them so much for it. Like a lot of new shows, it was a bit rocky for a while as it tried to find its tone (early eps were a little too cynical for the Muppets) and a lot of people didn’t like the more adult edge or the mockumentary style of storytelling, but I thought those were minor points. The gags landed far more often than not and were legitimately laugh-out-loud funny. Anytime Uncle Deadly was on screen was pure comedic gold. It only got better as the season went along, and a change of showrunners mid-season shored up the lingering weak spots. By the end, The Muppets was running on all cylinders. Unfortunately, it seems that the ratings damage was already done. and the show got axed. Bah. BAH, I say! I never expected to love Galavant. When my wife and I checked it out last year, we were expecting a light, fluffy, kid-friendly program, not a sharp, witty, edgy musical-comedy with some surprisingly catchy tunes. Season one ended on a cliffhanger, and I was worried I’d never see a resolution due to the show’s tepid ratings. The producers knew better for season two and ended things decisively, thought they left an opening or two to continue the story in case season three got the green light — which it didn’t. I can’t complain, though. I feel a show like this could too easily get stale if it went on too long, so I’ll take two solid seasons and a high note conclusion and be happy for it. Conversely, I’m unhappy that Agent Carter is also over after two good seasons. In so many ways the series is superior to Agents of SHIELD and has one of the best protagonists on TV in Peggy Carter (Hayley Atwell), as well as one of the best partners in her totally platonic buddy/sidekick Edwin Jarvis (James D’Arcy). Their chemistry and crack comedic timing were on full display in the second story arc, which took Peggy to California where she crossed paths with Whitney Frost (Wynn Everett), who is known to comic fans as the super-villain Madame Masque. Alas, we didn’t get to see Frost in full-on Madame Masque mode, and probably never will thanks to so-so ratings. Fortunately for Atwell and her fans, she’ll be returning to TV next year in a new series, but she should have been coming back for a third go-round as Peggy. While it bears little resemblance to the Vertigo title, iZombie is entertaining nevertheless. It’s basically a procedural, but the gimmick here is that the heroine, a medical examiner, is a zombie who, after consuming someone’s brain, takes on the subject’s personality and has flashes of their memories. The writing in spots is cheesy, as evidenced right up front with the main character, Olivia Moore (Rose McIver) — aka Liv Moore, ha ha — but the jokes fire off consistently and the characters are likable, and when it comes to procedurals, that’s all I really need. I don’t expect deep drama and compelling plots. However, the show could be getting more ambitious in that regard next season. The finale was a major game-changer and I’m curious to see where they take it. I plan to stick with Arrow into season four, mostly because I’m jazzed at the prospect of a massive four-show crossover that the producers have been teasing, but season three had some serious frayed edges. The show’s worst sin was killing off Laurel Lance/Black Canary (Katie Cassidy). One producer said the decision was born of the fact that “It kind of feels like Laurel’s story has come to a very organic… if not ‘conclusion,’ certainly a ‘plateau. '” But apparently finding a new story for her was too much of a hassle. And then there was the finale, which traded a logical story for some cheap feels. One guy shouting “Stop!” atop a car before delivering a poor man’s St. Crispin’s Day speech quells a raging riot within seconds? And Oliver uses magic that he barely learned a few weeks earlier to stop a demi-godlike bad guy? Yeesh. I hope Arrow takes a few steps back next season and goes for something a little smaller and more personal rather than yet another overblown “villain plots to destroy the city” story. Agents of SHIELD has improved considerably since its tepid first season (specifically the first two-thirds of the first season, prior to the events of Captain America – The Winter Soldier) and is entertaining, but it has yet to become truly awesome. The season finale had some good twists and emotional depth, but it felt like too little too late for this particular season. The show has a great cast, likable characters, maybe the best fight scenes on TV, and has finally found a consistent sense of low-key humor. What it lacks is strong season arcs (the Inhumans storyline is getting old and feels like it’s not going anywhere significant) and a real sense of place in the Marvel Cinematic Universe. Marvel could decide tomorrow that the events in Agents of SHIELD never happened, retcon the show out of existence, and it would have absolutely no impact on anything that’s happened in the movies. Marvel could also learn a lesson from DC when it comes to appeasing the geek audience. The DC shows constantly mine the DC Universe’s deep vault of characters, but Marvel barely scratches the surface of its available roster. RIP HUNTER: All right, people, don’t go screwing around with the timeline. TEAM then proceeds the screw around with the timeline. RIP HUNTER: What did I tell you?! TEAM: Well, what were we supposed to do? I mean, we’re not big picture people here. I had higher hopes for this show. I love Jaimie Alexander, the concept was intriguing, and it was good, but it somehow never rose to greatness for me. The supporting characters, with the exception of techie Patterson (Ashley Johnson, who you might know as the waitress from the closing scenes of The Avengers), are as boring as a beige room, and as the season progressed the plot relied too much on the trope of characters keeping secrets from one another. The finale shook things up considerably and is poised to send season two in a whole new direction, buy I don’t think I’ll be sticking around for it. The big plot twists were predictable and so they didn’t excite me enough to make me want to see how things play out. For Alexander’s sake I hope the show has a healthy run, but in the end it just wasn’t my thing. This show was never high art, but that’s not a criticism. It was meant to be a fun procedural that featured a likable cast headed up by Nathan Fillion and Stana Katic engaging in lighthearted shenanigans, and for eight seasons that’s what it was. The last season or two were a bit shaky but they were generally satisfying. The series finale was mostly satisfying. It had action, tension, and it didn’t end as many speculated it would, with Beckett (Katic) dying — but that’s only because the show didn’t get renewed. Take out that clumsy, tacked-on coda and it’s obvious that season eight was supposed to end on a cliffhanger and season nine would have opened with the reveal that Beckett had died. That would have been an insult to the viewers, so at least I’m glad the series ended on an upbeat note. Ugh. This show used to be such fun…back in season one. Its Ichabod Crane and Abbie Mills versus the Four Horsemen of the Apocalypse storyline was gleefully off-the-wall, but with each season the show veered away from its core concept — ostensibly to make it more accessible by doing away with its heavy focus on the mythology and going a little more threat-of-the-week. It also grossly mishandled its female characters and watered down a diverse cast with bland white people. In this most recent season we watched two flat, dull villains stand around delivering stiff dialog badly episode after episode while Abbie Mills (Nicole Beharie, who deserved so much better) did nothing of consequence until finally sacrificing herself in the season finale. As of this writing, the show could be renewed, in which case Crane would receive a new partner, but who cares? Like Castle, the dynamic between Sleepy Hollow‘s two principle characters fueled the show through its weakest episodes and made its strongest episodes truly memorable. When you kill one of them off, what’s the point in going on? Did no one learn any lessons from The X-Files? I’m an old-school X-Phile. I watched the original series religiously and to this day I have a huge crush on Gillian Anderson. I awaited the revival with cautious optimism but low expectations — which, I’m sad to say, were met. The series returned to its classic form to a fault. Chris Carter made the show’s already convoluted, ill-planned-out mythology even more confusing in the first episode, which set up a plotline that went ignored until the last episode, which not only failed to resolve the arc, it ended on a cliffhanger. The episodes along the way were hit and miss, and when they missed they missed HARD. The revival was so crushingly bad, if I watch the next season (which is in the works) it’ll be with the same sort of perverse curiosity with which one checks out the aftermath of a car crash.